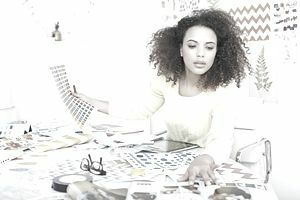 What Is It Like to Be an Interior Designer? What Does It Mean to Be an Interior Designer? Interior design is a career choice that involves much more than creating warm, comfortable, and interesting home environments for other people. It is about optimizing space, natural lighting, and more in ways that are efficient and inviting, among other traits. Interior design is about creating a beautiful, comfortable space that makes the best of what a home or office initially offers and improving on the least appealing aspects of the space. For example, a client struggling with how best to utilize a room with an unusual geometric layout might bring in an interior designer to make the space more appealing. As an interior designer, it's necessary to have a vision for projects you are working on, but that vision also must meet the needs and expectations of a client. For example, a client who hires you to redesign a waiting room is likely to have a few basic standards that must be met. They'll want the space to be inviting and comforting, and they'll want it to be designed so foot traffic moves naturally from a check-in area to chairs to internal offices. As an interior designer, everything you do must follow a client's basic request. You certainly will have your own ideas about how best to use a space, and it's your responsibility to lay out all options for a client, but your decisions ultimately have to be made within the parameters established by the client. The creative side of the business might be what draws you to interior design, but working with clients also means working within their budgets, meeting their deadlines, and establishing relationships with relevant subcontractors and suppliers that can help you and your clients meet your visions. These subcontractors and suppliers are likely to include painters, wallpaper designers, electricians, furniture manufacturers, fabric wholesalers, and others as needed to make the design process seem effortless and stress-free. While anyone can hire individual subcontractors, part of being a good interior designer is knowing which subcontractor or supplier is right for which job. For example, a piece of specific furniture might be a good fit for one job but not another depending on the desired design. Matching the right resources to the right jobs is a big part of interior design work, and having strong professional relationships with the various subcontractors and suppliers in your market can help you to get the best prices and the best service. As an example, a supplier who does a lot of work with you and knows you to be professional and reliable will be more willing than a stranger to expedite an order to meet a deadline. Considering the overall space of a home and its individual rooms is one of the first things that an interior designer will consider. The dimensions of the space and how it was constructed are key features you must be aware of before you can move forward. What are the limitations of the space and what is its potential? What will the space be used for—relaxation, family, entertaining, or business? Some of the practical considerations that should be considered are the lighting, the sound, seating arrangements, and identifying other needs such as requiring a place for storage and a workspace that ideally stimulates the senses. Health and safety concerns also must be taken into consideration when designing a specific space or home. To address these needs, you must learn about the needs of your clients and identify what amenities would be appropriate in better meeting their needs. Are there certain psychological or behavioral needs of the occupants that should be addressed in the overall planning of the design, and is there an environmental impact on the way that the design is created? Many people use the terms "interior design" and "interior decorating" interchangeably, but there is a significant difference. Interior decorating is mainly about using various forms of color and accents to make a particular space more visually appealing. Decorators arrange objects such as art, photos, pillows, floral arrangements, and other things using what already is available. Interior decorating is strictly about the art. Interior designers, however, must be able to apply creative solutions to the spaces they are trying to design. They must have the technical expertise to know the vast array of options that they can apply to any one space. The goal of an interior designer is to work to improve the surroundings and the quality of life of its occupants. Interior design is about both art and science and how to use these two disciplines in creating a beautiful outcome.